The Women are Persons! Monument. The Women are Persons! Monument is located in Calgary's Olympic Plaza. 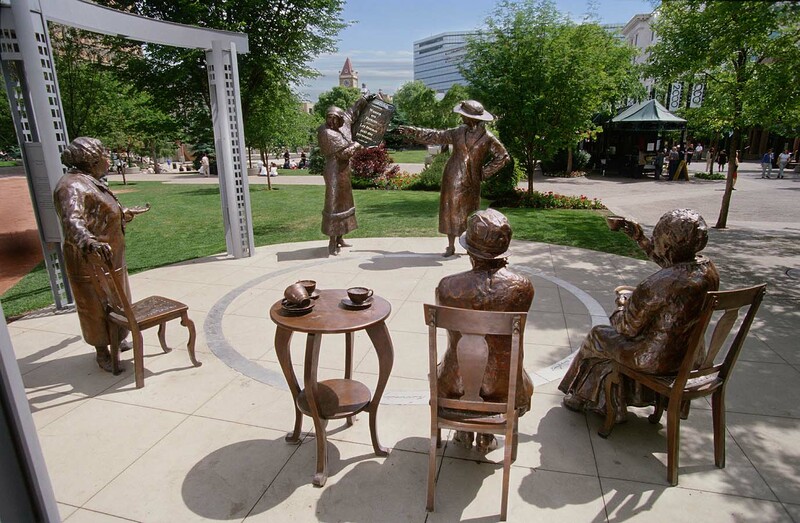 It was commissioned by the Famous 5 Foundation to "honour the Famous 5, to commemorate the ‘Persons' Case, and to recognize the achievements and contributions of Canadian women in the building of Canada". The monument was unveiled by Governor General Adrienne Clarkson at a special event on October 18, 1999. A similar monument was erected in Ottawa on October 18, 2000. Five Alberta women fought to have Canadian women recognized constitutionally as "persons" who were eligible to be named to the Senate. Emily Murphy led the battle and she was supported by Irene Parlby, Louise McKinney, Henrietta Muir Edwards and Nellie Mcclung. The Supreme Court of Canada rejected their case in 1928 but the Judicial Committee of the British Privy Council decided in favour of the women on October 18, 1929. These courageous ladies came to be known as the "Famous Five" and October 18 is now known as Persons Day in Canada. Copyright © 2004 Merna M. Forster. All rights reserved.